Download the latest fully-function 30-days evaluation version of PDF Manager. Note: you can use the evaluation version for 30-days with no functional limitation. The size of downloadable file is 5 MB. While downloading PDF Manager you can sign up for the free PDF Manager email newsletter. We e-mails it every 3 weeks to stay connected with our users. Visit newsletter forum for all newsletter issues. 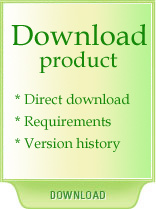 Download PDF version of the PDF Manager brochure [ 368 Kb]. Find below minimum and recommended system components to install and use PDF Manager. The version history of PDF Manager releases.